currently enrolled in the program and those who join after August 31, 2018. 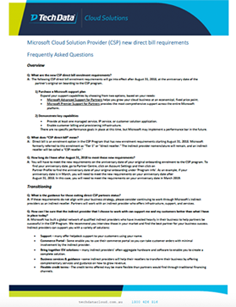 You can find more information about the new CSP requirements in our FAQ summary. If these requirements do not align with your business strategy, consider switching to Tech Data as your indirect provider and become a CSP indirect reseller. Our CSP program experts will take you through and oversee the process to migrate your CSP subscriptions. WHAT ARE THE KEY BENEFITS OF PARTNERING WITH TECH DATA? 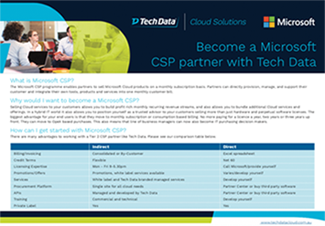 Read more about the benefits of becoming a Microsoft CSP Partner with Tech Data.